The maximum cash out from this bonus is $100. True Blue Casino is an online casino targeted mainly at players from Australia. As the name suggests, this casino stays true to the blue flag of Australia and really exudes a certain sense of nationality and patriotism through its theming. The casino is one of the newest additions to the online casino market with some great gambling options. True Blue casino is licensed in the jurisdiction of Curacao. Online casino players from Australia have plenty of look forward to in terms of games, hassle free banking, a richly rewarding loyalty program, bonuses and much more. In terms of casino layout, True Blue casino has a very intuitive design and it is easy to navigate in and around the website. Right at the top, you have a menu bar running horizontal and it has links to the main sections of the website such as Home, Promotions, VIP, Banking, Contact Us, Sign Up and Login. Registering with the casino is easy and takes only a matter of minutes. Just select your username, create a password, put in your email and country information and then click on continue. In the second quick form, you will have to fill in your first name, last name, gender and date of birth. Lastly, you can provide your phone number and address and your account will be successfully created. Change the way you play pokies with the amazing 250% no max limit bonus at True Blue Casino. Read on here no to see how this bonus can drastically alter your game play. Are you looking for a Chinese-themed online pokie that you can play at home and on the go? 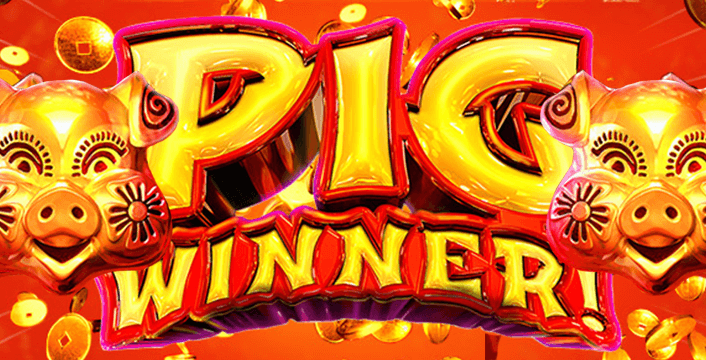 Enjoy the new Pig Winner slot game at True Blue Casino now and bring home the bacon!. 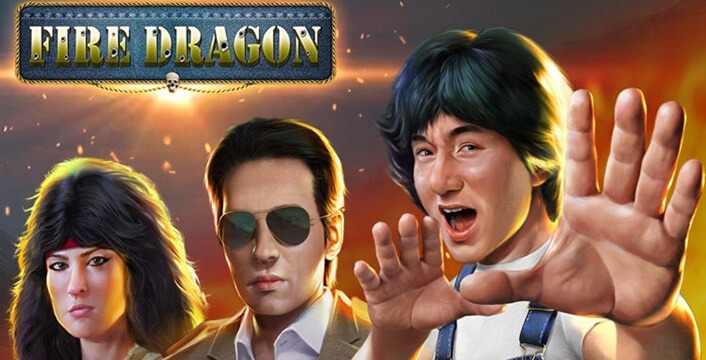 Try Out the Brand New Fire Dragon Slot and Get 80 Free Spins! Get rewarded for trying out the brand new Fire Dragon slot at true Blue Casino now. Pick free spins AND a match bonus! Read on here for more. 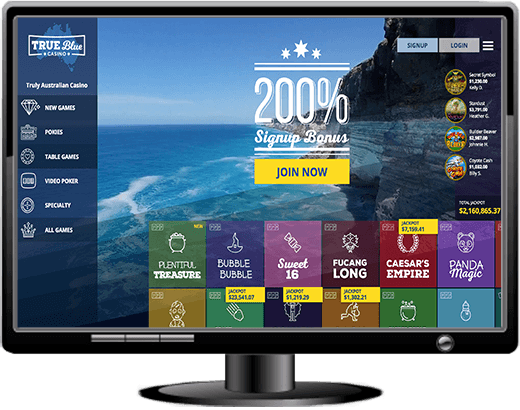 Unlike several other online casino websites, True Blue casino is powered by a single online casino software supplier, namely, Realtime Gaming. If you are familiar with online casinos and online casino gaming, you would have surely come across the brand Realtime Gaming or RTG. They are one of the best online casino software suppliers in the industry and are right up there with the likes of Microgaming and NetEnt. True Blue casino features some of the best games from Realtime Gaming and constantly updates their collection to include the latest releases. RTG is especially known for their pokies which is easily the most popular type of online casino game in Australia. They’re also renowned for having high performing games that are snappy, lag free and responsive. There are plenty of different types of games on offer too and this includes pokies/slots, progressive jackpots, Baccarat, Bingo, Blackjack, Caribbean 21, Craps, Keno, Poker, etc. Furthermore, RTG offers both download and instant play games. Instant play games are especially convenient as you can just login and start playing within the browser itself in a matter of seconds. True Blue Casino has been designed responsively, which means that the casino website will adjust to different screen sizes depending on the device being used to access it. Therefore, you can play on True Blue Mobile casino mobile devices as well. This includes both tablets as well as smart phones. There is no exclusive application that you will need to download onto your device either. Since the mobile casino games are instant play, all you need to do is launch your mobile browser, be it Google Chrome, Safari, etc. and then just go to the True Blue Casino website. Login, select your game of choice and get started playing within the browser itself. Thanks to technologies such as HTML5 and Flash. Given that you don’t have to have a dedicated application to be able to access and play on True Blue Casino. This means that you can play on any device as required. All you need is a working internet connection and that could be via either Wi-Fi or Mobile Internet. True Blue casino supports most smartphones in the Australian market including iOS devices, Android devices, Windows mobile devices, Blackberry, etc. Also, it is easy to bank on your mobile device as well. All payment methods are available on mobile as well. You can use a single account (user name and password) to play on both desktop and mobile. Realtime Gaming makes some exceptional pokies, but another thing that they excel in is progressive jackpots. Progressive jackpots are essentially pokies with much bigger payouts. The way these jackpots work is that every time the game is played, but the jackpot is not won, the money wagered is added to the jackpot and this happens until a lucky player wins the cumulative jackpot. Some of the most popular progressive jackpots from Realtime Gaming are Aztec’s Millions, Bank, Blacksmiths, Bronze, China Town, Jackpot Pinatas, Cleopatra’s Gold, Let’em Ride, Sapphire, Spirit of the Inca, etc. True Blue Casino hosts some great progressive jackpots for their Australian players to enjoy and stand a chance of winning a truly life changing amount. 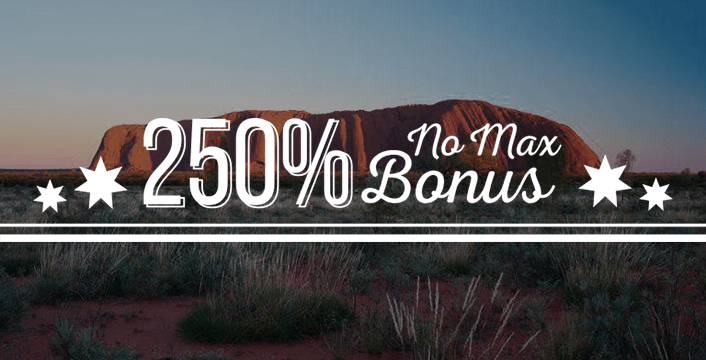 True Blue Casino has a generous Australian heart when it comes to its bonuses and promotions. They not only offer a decent welcome bonus which gives you the kick start you need, but they also provide regular bonuses for existing players as well. Welcome bonus: We’ve negotiated a rewarding and irrespirable welcome bonus for you. Make your first deposit at True Blue casino and receive a match bonus of 200%, up to a maximum bonus amount of AUD3000. This basically means that if you were to deposit an amount of 100AUD, you would receive an additional 200AUD as bonus money. As icing on the cake, the casino also tops off the 200% welcome match bonus with 33 free spins which you can use to play select slots and table games. The terms and conditions with respect to the welcome bonus are pretty traditional. First, there is a playthrough requirement of 30x which needs to be satisfied before you can withdraw the bonus amount. For blackjack and table games, this requirement is 60x. There is no max cashout limit and the code to redeem the welcome bonus is TRUE200. The minimum deposit required to be eligible for the welcome bonus is $15. True Blue casino is backed by a professional and well-trained customer support network that is operational round the clock, 7 days a week. The website also has an extensive FAQ section where most common questions and queries are answered. The FAQ section is well structured and you can find what you are looking for fairly easily. In case you do need to reach out to the customer support team, you can do so via live chat which is only a click away. Alternatively, you can also shoot them an email and they generally respond within 24 hours. True Blue Casino makes banking simple and easy. The casino only accepts Australian Dollars and Bitcoins. There are multiple ways to make deposits, and several accepted withdrawal methods as well. The weekly withdrawal limit is AUD2500. For deposits, you can use EcoCard, MasterCard, Neteller, Skrill, Visa and Bank Wire Transfers. Supported withdrawal methods are EcoCard, Neteller and Skrill. If you are banking in a currency other than Australian Dollars, you will have to convert at the time of processing the transaction. Deposits are usually instantaneous at True Blue Casino. This means that once you make a deposit, the money is in your True Blue Casino account right away for you to use and play with. However, withdrawals are subject to some verification procedures and usually subject to a longer processing time. When it comes to withdrawals, it could take anywhere between 24 hours – 10 days for it to come through depending on the withdrawal method chosen. E - wallet withdrawals usually take up to 24 hours and withdrawals requested through wire transfer could take anywhere between 5 – 10 days. If you happen to be an online casino enthusiast based in Australia, then True Blue casino may be the perfect choice. It accepts Australian dollars without any need for conversion and also has one of the most reliable customer support teams to assist you at all times. They have the best games from one of the best casino games developers and also provide some mouthwatering bonuses for you to take advantage of. All in all, True Blue casino stays true to the Australian flag by being one of the best casinos out there.